Use this pattern to design multiple paths with activities executed in parallel: simply add outgoing connectors from the activity where the path splits into multiple paths. When the process is executed, the sequence of activities in each parallel path is executed independently. 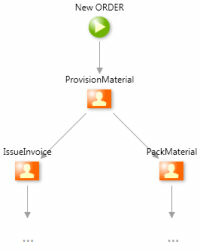 As an example, think of a process to handle orders that starts provisioning the ordered materials and then has two tasks performed in parallel: invoicing and packing materials. To join parallel paths back into a single path, that is executed only when all parallel paths are finished, simply move the parallel paths into a new Process and use a Execute Process to execute that process. When the process is executed, the Execute Process activity executes another process containing the parallel activities: this process is only finished when all of its parallel activities are finished. 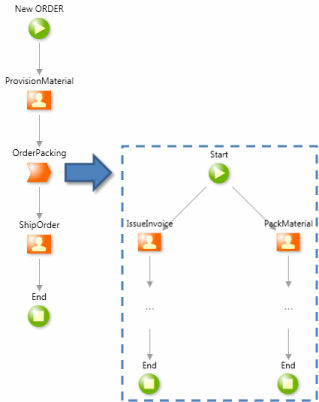 As an example, think of a process to handle orders: provision materials, invoice and pack materials, and ship the order only when the order is completely packed. To join parallel paths back into a single path, that is executed once one of the parallel paths is finished, simply move the parallel paths into a Process and use a Execute Process to execute that process. And, in the new process, set theTerminate property of End elements to &apos;Yes&apos; to ensure it terminates once a path ends. 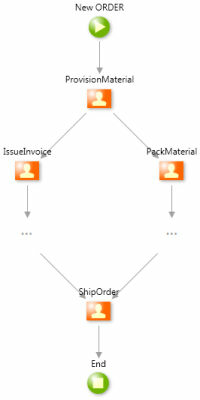 When the process is executed, the Execute Process activity executes another process containing the parallel activities: this process terminates once one of its parallel activities finishes. 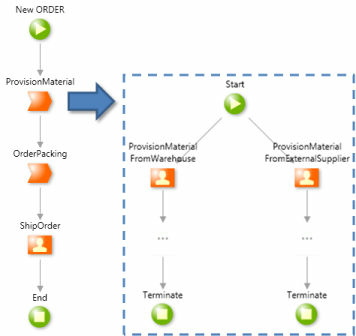 As an example, think of a process to handle orders: provision ordered materials either from the existing stock or from an external supplier, handle the order, and then send it. Joining with no synchronization: the joined path is executed multiple times, once by each incoming parallel path, with no synchronization; there&apos;s no simple way of using information from each parallel path in the joined path. Joining with bad synchronization: a Decision is used for synchronizing parallel paths; the decision&apos;s logic is complex and not exempt from concurrence problems, thus it may return wrong outcomes; there&apos;s no simple way of using information from each parallel path in the joined path.